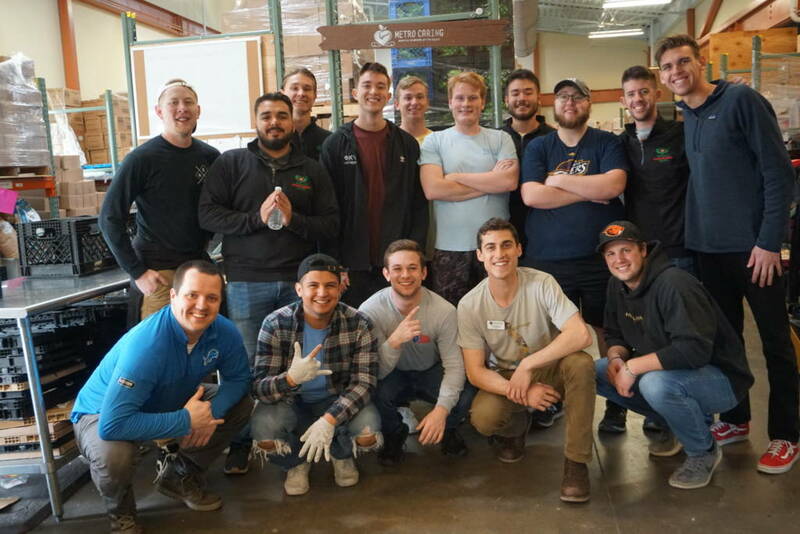 In March, 13 undergraduate Phi Psi’s traveled to Denver, CO to help eradicate poverty in the area by engaging with the local community and volunteering at their nonprofit organizations. 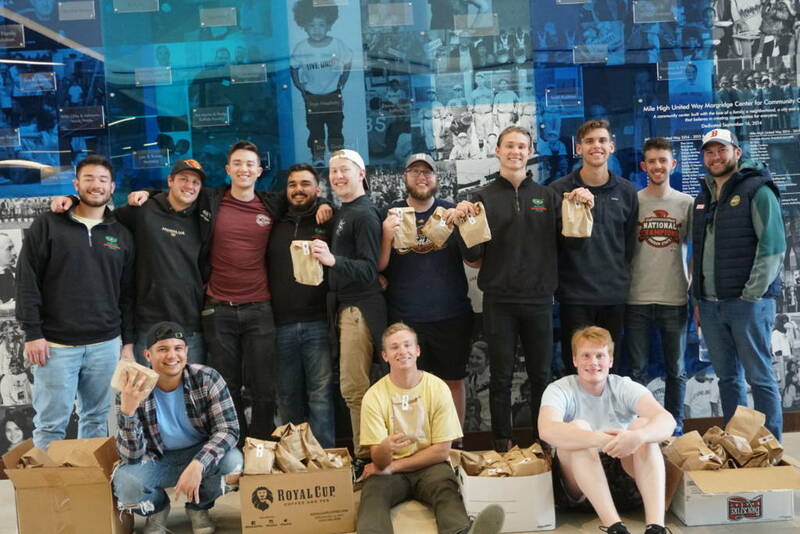 During this week long Service Immersion Trip, brothers worked with four amazing organizations that focus on providing daily relief for the impoverished as well as creating long-term sustainable solutions to break the cycle of poverty. To view the full photo album from this trip, please visit the Phi Kappa Psi Facebook page. 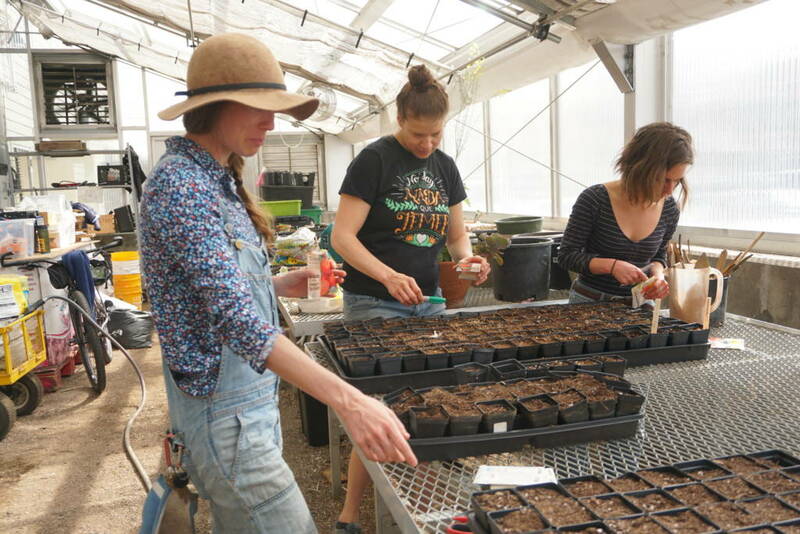 Attendees worked with local food rescue and distribution center, Food Bank of the Rockies. 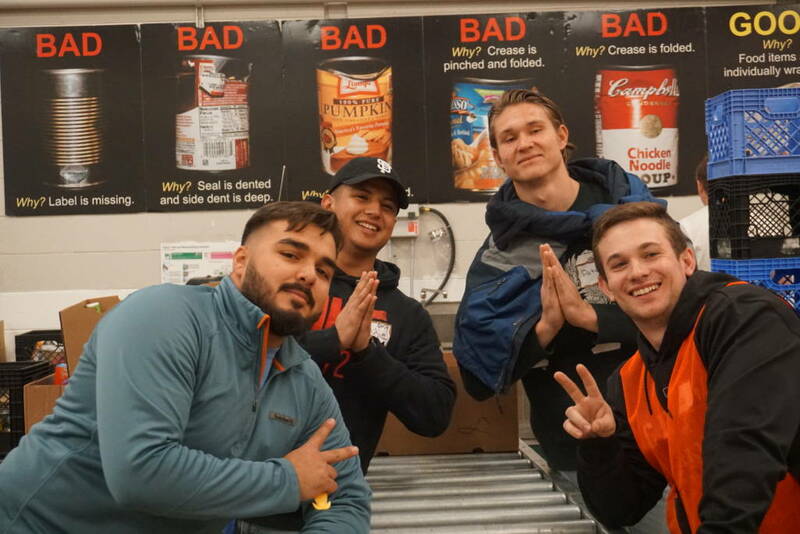 Their first shift consisted of working in their reclamation center organizing 11,800 pounds of food donations. They returned a few days later to load pallets up for at least 20 deliveries to local agencies. 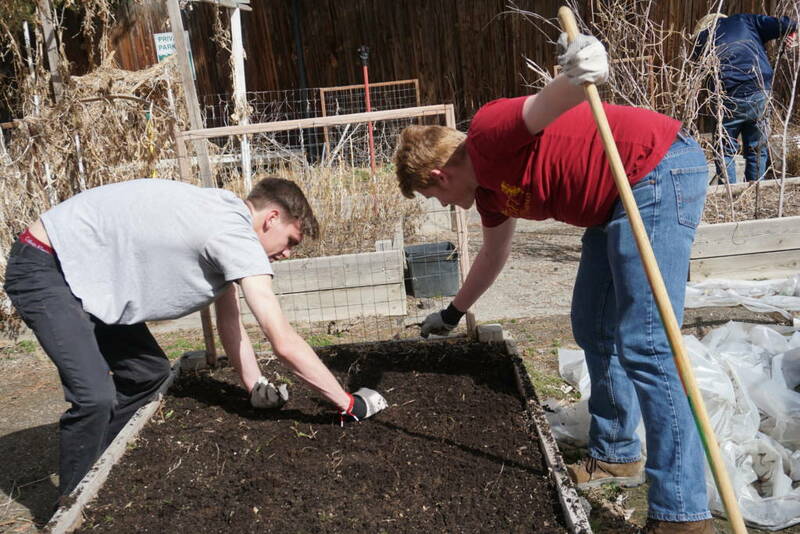 The Denver SIT group got the opportunity to collaborate with Hope Communities to clear out and prepare their 39 community garden plots, which included raking out the plots, pulling weeds, and painting numbers by hand on each plot. Community residents are encouraged to contribute to the gardens by planting seeds that tie to their cultural heritage, as a majority of the residents are refugees. Students also painted offices and meeting spaces that Hope Communities uses for their resident programs. 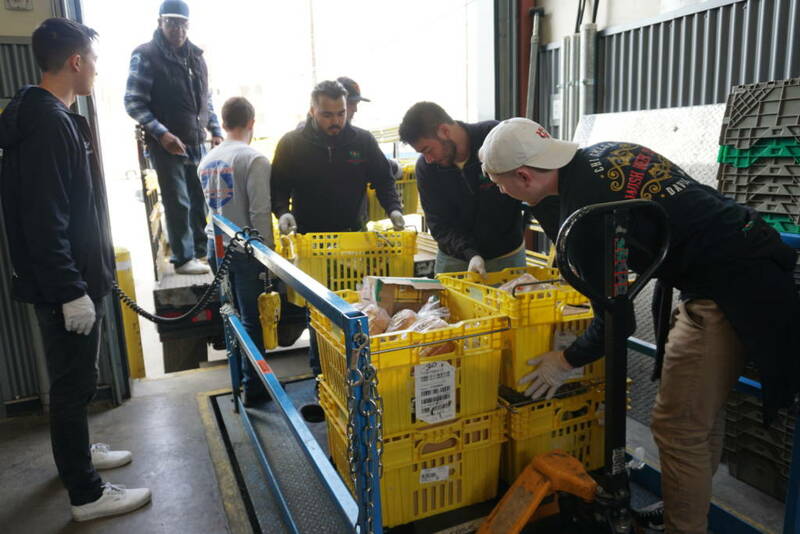 At Metro Caring, attendees processed food donations from local partners, organized them to be placed in their cooler/freezer, their back room storage area for eventual placement in their community market, and fresh produce that went directly into their market. 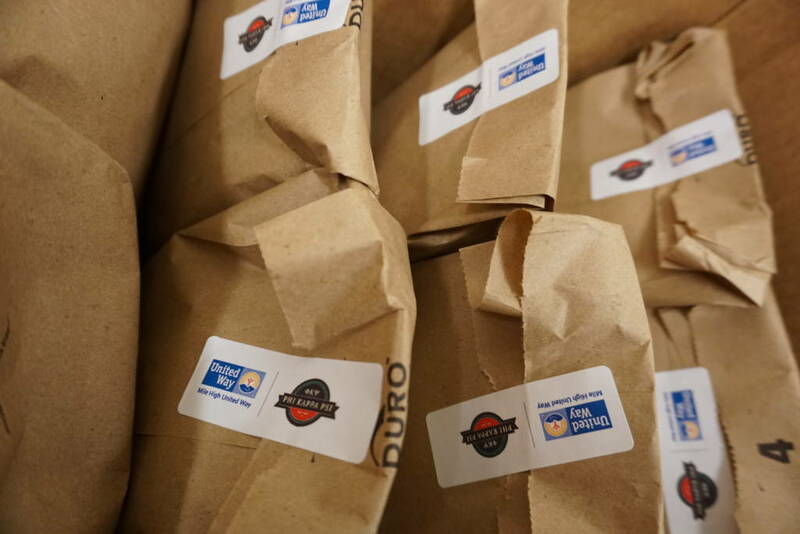 At the United Way, attendees made sack lunches for the elderly homeless. One group made the sandwiches, others setup the bags and placed other food items in each bag. Another group wrote notes of inspiration for each bag that was delivered to the local senior support center. They packed 100 bags and donated $200 to the cause, and finished by delivering the packed lunches. First and foremnost, we would like to thank Phi Kappa Psi and its donors for making this whole event possible. Second we would like to thank Kyle and Lauren for being outstanding facilitators throughout the Immersion Trip. 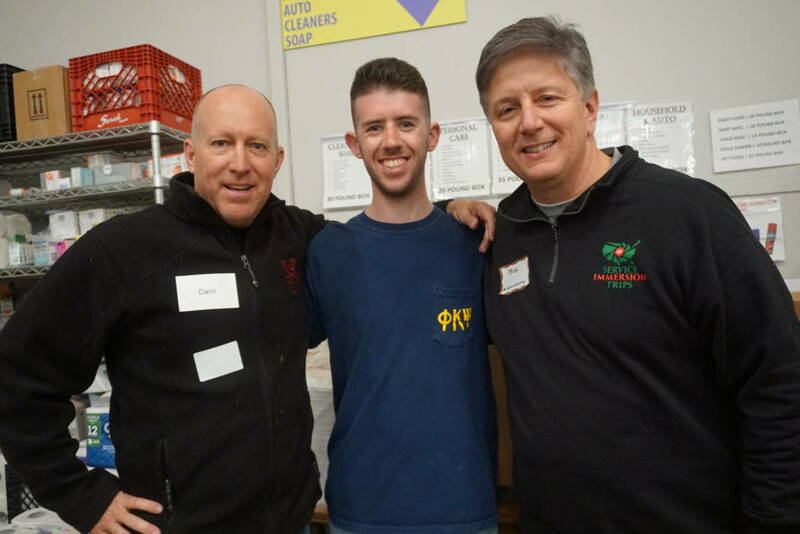 This event really embodies what Phi Kappa Psi is really about, “The great joy of serving others.” Below, Cal Iota, we are pictured at the first service opportunity in Denver. Throughout the week, Cal Iota, grew close to the other chapters there. Through outreach and helping the community we grew closer than any of us could have imagined. With this connection we are able to understand what the true brotherhood of Phi Psi means as well as live up to our motto. We know for a fact that this trip should be repeated and improved upon for many years to come. We also know that every single brother that attended this trip will go back to their respective chapters and report how productive and life changing this experience was. It is our hope that Alumni donations can continue to fund this program so that others can experience this opportunity like ourselves. At the end of each day we took time to reflect on our experience that day and talk about the impact of our work. During these reflections we learned a lot about ourselves and others as the facilitators asked thought provoking questions and really challenged us to open ourselves up. Each reflection was different because our service project for the day was different, which allowed us to talk about the different and unique impact we made each day. Learning about each others viewpoints in the group really connected us by listening to differing opinions and getting more creative together. All in all, this Service Immersion Trip is a one of kind experience that we had the privilege to be part of. 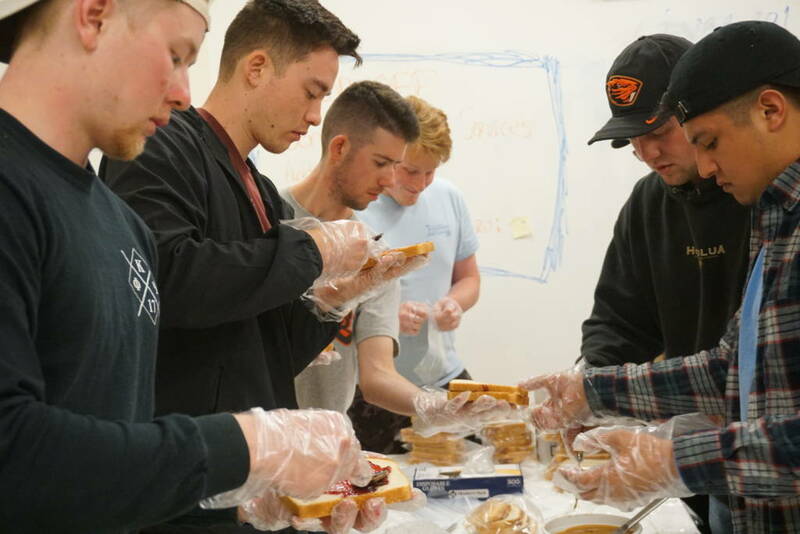 Cal Iota hopes to send more of its members for future trips and hopes to see other programs like this to be implemented within the National Fraternity. Being able to “Squash Poverty” with brothers from other chapters was something we will never forget and hope to maintain relations with. Once again we would like to thank the National Fraternity and its donors, as well as Kyle and Lauren for making this event to be possible. First off, I want to thank everyone at Phi Kappa Psi that made this trip possible. To all the donors and alumni that dedicate their time and money to starting such a great tradition. Although we may have only spent a week in Denver, I know that there was over a year worth of planning that went into this trip. I can’t thank Kyle Hickman and Lauren Krznarich enough for how productive and insightful the trip turned out to be. This has been one of the best spring breaks I’ve ever had and I know that I will be able to reflect upon this experience for many years to come. It was obvious that everyday was thought out meticulously and that everything had a purpose behind it. The whole purpose of the trip was to truly understand poverty and learn what we can do to prevent it. I’ve learned that poverty can be broken down into three main components; lack of food, lack of shelter, and lack of education. Each of the nonprofits that we worked with emphasized a different component of poverty. So by the end of the week we were able to experience all three phases of what it takes to fight poverty at the community level. On Monday we worked with the Food Bank of the Rockies where we were broken into groups of three. We put together orders of donated food that would be sent to other small scale nonprofits. Once all the orders were put together, we then organized through all their donated goods. Splitting up donations into grain/ cereal, snacks, produce, home goods, etc. On Tuesday we worked with Hope Communities which offers cheaper living alternatives to refugees and other minorities. At one of their apartment complexes we prepared their garden beds so tenants would be able to have their own person garden outside. At the same complex we also repainted their main community/ meeting area to make it more comfortable and inviting. Members of the community hold educational and empowerment meetings in this space which directly benefits the surrounding community. Wednesday was spent as a free day where we got to explore Denver. We went to the local botanical garden, aquarium, downtown, and even the Avalanche vs Golden Knights hockey game. Thursday we partnered with Metro Caring, who acts like a local grocery store that is completely dependant on donations. At Metro Caring we sorted through all the donated food and helped stock their shelves. As the day went on we ended up clearing a whole weeks worth of inventory within an hour, which is the fastest the have ever seen. 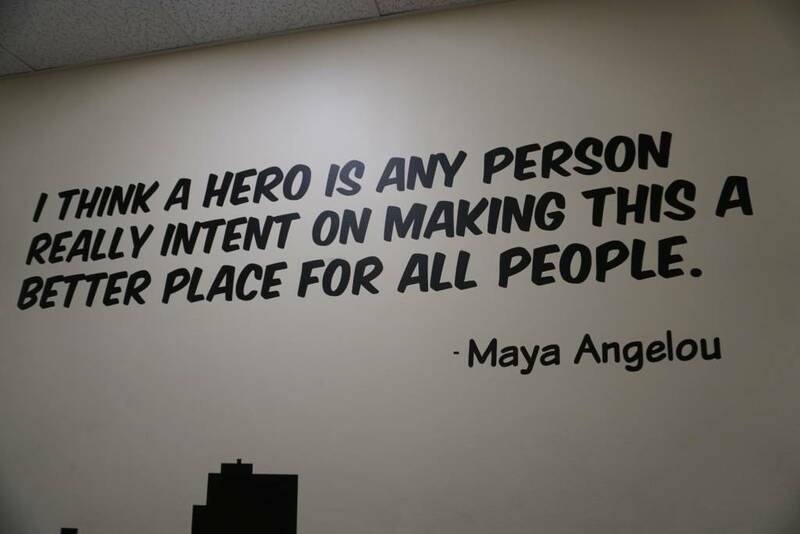 After working with Metro Caring, I realized how full circle the work we were doing actually was. It could have been very possible that one of the orders we put together Monday, could of been delivered to Metro Caring. Friday, we went back to Food bank of the Rockies for half the day to start this cycle all over again. To end the day, we went to United Way to make/ pack lunches for senior citizens affected by poverty. Each lunch consisted of a PB&J sandwich, granola bar, water, and a handwritten inspirational note. 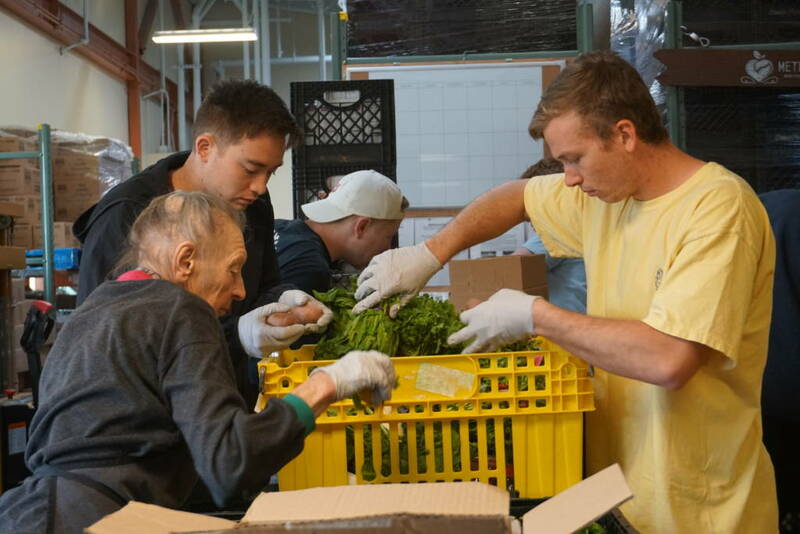 After packing about a hundred bag lunches, we personally delivered them to a local food bank that directly connects to seniors in the community. This week of directly interacting with those affected by poverty and working with nonprofits has taught me so much. One thing that stood out to me was the pattern I saw when it comes to volunteering at nonprofits. I learned that almost all of the frequent volunteers had a direct connection with the nonprofit because they have been positively impacted by it. The volunteers were normally over the age of 55. They all genuinely cared about the work they were doing, but lacked the energy we have as youthful fraternity men. Everywhere we went, I felt that our energy and youthful spirit became contagious to everyone else working. All the volunteers were so surprised to see us, a group of fraternity men, volunteer our time. As surprised as they were in the beginning, they were so sad to see us leave. I realized how important it is to dedicate your time while you are young and have energy and ambition. One of the main reasons why this trip was so memorable was because it was spent with such amazing people. There was 13 active members in total. There was five of us from Oregon Beta (where I’m from), three from UC Davis, two from Akron, two from UC Riverside, and one from UC Irvine. Right off the bat we all clicked with one another and instantly became true brothers. Together we were able to reflect and have some very constructive conversations about our experiences serving poverty. I know that I will be in touch with all these other members who were also willing to give up their spring break in the name of service. I am so humbled to be apart of the first service immersion trip to Denver. I am going to recommend this insightful experience to everyone in my chapter. I know my chapter is going to be positively benefited with the experience that my four brothers and I had in Denver. Coming back to my chapter I am making it a point to start a partnership with a nonprofit in our local community. Dedicating my spring break to demonstrate the great joy of serving others was an absolute blessing. I have gained knowledge as how to battle poverty while I gained some truly amazing friendships. LEDN. 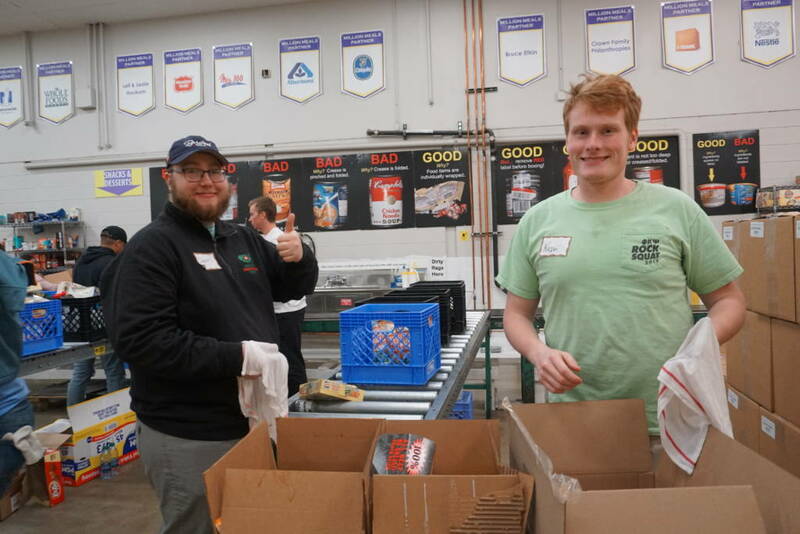 I would like to start this write-up of my experience of the Service Immersion Trip by first thanking the Phi Kappa Psi Fraternity for choosing myself along with 13 other brothers from across the country to have a chance to make an impact with our service. This trip was really the epitome of our maxim of “The Great Joy of Serving Others” and I really took this to heart in each of the projects that we participated over the week. After hearing about the trip during both GAC and PDC this past year, I was very adamant on participating in a trip like this so I was one of the first in my chapter to apply and was able to get four more chapter brothers to join me on the adventure. I know for myself I will be utilizing a lot of the skills learned to help my own chapter figure out how to better structure our service projects that we participate in. The fact we were able to attend this trip for a small sum of $100 and have the rest come from the very gracious donor to this fraternities cause. Between the five brothers that went on this trip from my local chapter, I think all of us have a better understanding of what poverty is and resources to advise those in need to check out. 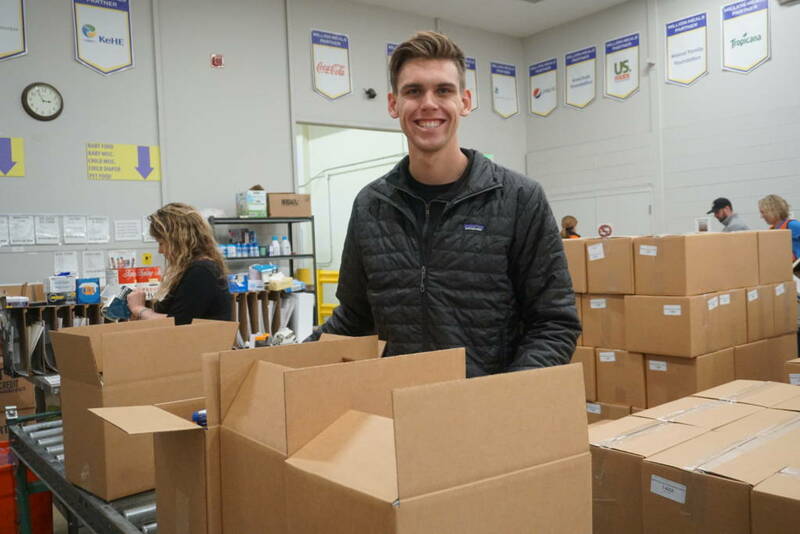 We did larger scale projects that most normal volunteers get to see on a daily basis and actually be able to at the beginning of the week working on filling out orders at the Food Bank of the Rockies for organizations that we would potentially help later on in the week. All of the volunteers and workers within the food bank were all so passionate about what they do that it definitely rubbed off on us as we went through the day. We also did more of this same work at Metro Caring Denver and the two experience dealing with food and nutrition led to a more hands on approach and interaction with the community. 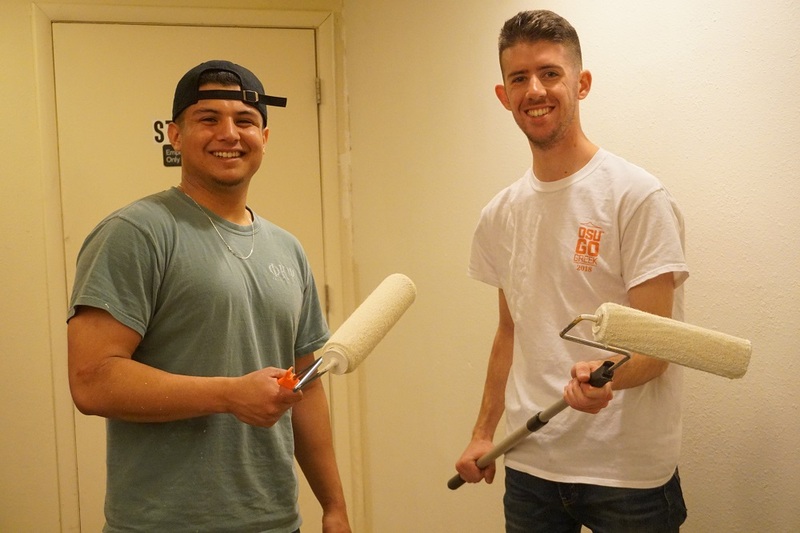 Between that we also spent some time working with the Hope Communities organization to renovate some of the refugee housing that they offer around the Denver Metro Area. Most of our group was split into two, one group in the garden they offered for residence, working to clean it up and another inside painting an area they use to teach the children elementary skills for being apart of something bigger. The organization had always dreamed of completing the tasks we did while we were there so it made myself and the brothers on this trip feel very humble about our work while we were still there. “The action of helping or doing work for someone” is the definition you find when you google the word service. Service is at the root, what we work towards as men of the Phi Kappa Psi fraternity. But this definition cannot define the emotions the raw joy we, the gentlemen of Phi Kappa Psi experienced on what was the first of hopefully many Service Immersion Trips. I came into this trip, seeing an easy way to travel for cheap, show up, do some simple service and enjoy my spring break. What I got out of the trip was more than I could have ever asked for. I had this image in my head of service being this tangible thing that made me feel better. For my chapter, service hours were just number, a quota needed to be filled each semester. Sure, I may have made others laugh and be thankful that I helped them, but I had never taken anything away from the work that I had done. My chapter did the usual. We worked in food banks, elderly homes and a clean up jobs after events. Sure, I helped people. I always felt thought that I was dragging my feet and I never put in my one hundred and ten percent. Service events bored me. I was there to do my fifteen service hours and call it a day. From day one in the beautiful city of Colorado my views, my opinions and my feelings about service changed. Being around guys I had never known but had this connection through shared values caused friendships to develop instantly. The shared awkwardness of being paid friends for a week automatically made service more enjoyable. From being almost too loud and obnoxious to being competitive of who could do the most work made time fly by. It made the volunteering work we did seem more like a vacation than service. Now, I know it seems like we may have just gone to Denver to make a fool of ourselves and take a trip for spring break. That was not the case, it made us better gentlemen, more mindful of our manor and morals and really helped us to accentuate the values we hold near and dear. I have never seen people be more thankful. Every event we did the staff were so impressed by how much we did. But to us, all we did was service. The fun of it all, the reward of helping people came so naturally. The gratitude of people was more of a reward than we could have ever asked for. The hours flew by and it seemed like nothing to us but to the people we served, it was everything. We helped weed planters one day. We worked outdoors all day, getting to see all kinds of foreign and eccentric plants that we may have never gotten to see. All day people passed by and watched us. They were thankful for what we were doing. Instead of them having to waste a whole doing one planter we were able to do more than thirty planters in one work shift. The pay to us was to get to see the gleam in their eyes. We got to feel the love and gratitude emanate from them. It was infectious. This changed everything for me. The way I view service. “Ask not what your country can do for you, ask what you can do for your country” were the famous words of John F Kennedy’s inaugural address. The same is for helping those in need. What can we, a group of rag tag “frat boys” do for you, we the men of Phi Kappa Psi are always prepared to help those in need? I know that we, the men of the “America Alpha Pledge Class”, stay vigilante and prepared to answer this call. First of all I would like to thank all the donors that made this beautiful trip possible. It truly was an amazing way to “immerse” yourself into a beautiful culture of working and learning with brothers from across the country to understand the depth, and join the fight against poverty. During the trip we worked with Food Bank of the Rockies, Hope Communities, United Way and Metro Caring. Each organization had a different role in attacking the different aspects of poverty. Food Bank of the Rockies primary concern was food distribution. They have a giant wearhouse where they sort, store and distribute the food across Colorado. We spent our first and last day of the trip here. We did various things such as packaging giant orders for various community centers, sorting donations and we also built orders for underprivileged children. Hope Communities is an organization that works to provide low cost housing for those who are struggling. While we were there, we split up into two groups. One group painted their educational and gathering rooms. The other group went to work in their garden. Hope communities has 30+ garden beds that they allow tenants to rent and use. These garden beds are very important to their community. As explained by Hope Communities there are many foreign tenants and growing native vegetables and fruits is something that helps maintain a diet they are used to and gives them a sense of home. We completely cleared out the remnants of last years crops, tilled the dirt, numbered the boxes and lacquered them. As we were working out in the garden many tenants came outside and walked through the garden, expressing gratitude for our work. 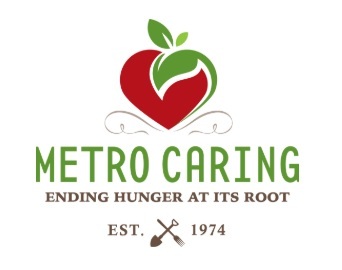 Metro Caring is an organization that serves as a free grocer for those who need it. They run purely off donations from other large chain grocers or organizations such as Food Bank of the Rockies. We came in and moved and sorted all their inventory. They told us that they have never seen a group of volunteers work as hard as we did and were proudly toubted our self proclaimed nickname “The Machine”. The last partner that we worked with was Metro Caring. They are kind of the “mother” organization for the non-profits in the Denver area. Metro Caring provides a multitude of services and will direct someone to an organization that can help their problem if they can’t directly do it. For Metro we put together and delivered lunches to an elderly community. Each non-profit gave us an idea about why they do what they do, who they support and how they feel that their impact is being felt. After our work for the day was done we did a reflection. These reflections were powerful roundtable discussions about what we saw, how we contributed and why the non-profits work was important. These were honestly my favorite part of the trip because instead of just joking around and doing labor, we had very educated and constructive discussions. Another very cool part of this trip was working with Phi Psi at a national level. It was very interesting to meet brothers from different chapters. We became a pretty tight knit group and bonded very quickly. Our relationships grew so strong that the brothers from UC Davis on the trip, are driving up to Oregon Beta to hang out together this spring term. The trip was so successful from a philanthropic, educational and bonding perspective because of the amazing work by Kyle Hickman and Lauren Krznarich. They did a great job in planning and facilitating this trip, and I wouldn’t of had it any other way. Overall this trip was very impactful to me on many different levels and I won’t forget it. Again thank you to the donors who made this possible. I’m proud to be a Phi Psi #LEDN. When I initially signed up for Phi Phi’s very first ever Service Immersion Trip, I was skeptical about how a group of only thirteen young men would impact the city of Denver. To be honest, I never thought that I could instantly click with my Brothers from across the nation (at least not within a week). Since no other Brother from my chapter showed interest in dedicating a Spring Break to service, I signed up for this program alone in hopes that it would change my personal outlook on poverty and homelessness. Focusing solely on my personal growth made me lose sight of my responsible to help those that are less fortunate than me. In contrast, the trip changed me in the way that I was passively hoping for. These so-called Brothers became my family after Day 1. We weren’t just any group of volunteers–we were “The Machine”. If you truly wanted to witness the effort and manpower that we unleashed on the food banks, I would simply tell you “you had to be there”. These local volunteers looked at us like we were crazy when we shouted “CRATE! CHIPS! MORE!” We cleared a week’s worth of inventory within hours of sweating and cracking jokes about Troy and his squash farming (hence the hashtag #SquashPoverty). A meaningful moment was when we listened to Hope Communities tell us about their mission and history. I was so proud to hear my Brothers ask engaging questions about their affordable housing complex, about their education programs, and eventually about the root cause of poverty. This then escalated to conversations about Plato’s Allegory of the Cave and a potential app that could connect people in need to providers and connect donors to their favorite charity. I remember the hard concentration that we had white painting the interior walls of their affordable housing complex white and painting numbers their 30+ garden lots. Besides working with Food Bank of the Rockies, Metro Caring, Hope Communities, and United Ways, we had an adventure exploring the city. We went to an aquarium, bowled with alumni, sent it to a hockey game, went face-to-face in volleyball, and ended the week with a final bonding activity around the toasty bonfire. Kyle and Lauren were tremendous guides to this incredible journey, ensuring that we not only made an impact but also reflected on how we could be servant leaders in our own community. Most importantly, none of this would be possible without the generosity of our alumni donors. I am beyond grateful for every memory that I was able to make with The Machine. There is no doubt that I will take cherish the week of service and inspire my Brothers at Cal Kappa to become servant leaders in not only Irvine but also the rest of the world. Immersion. It is a very interesting word. 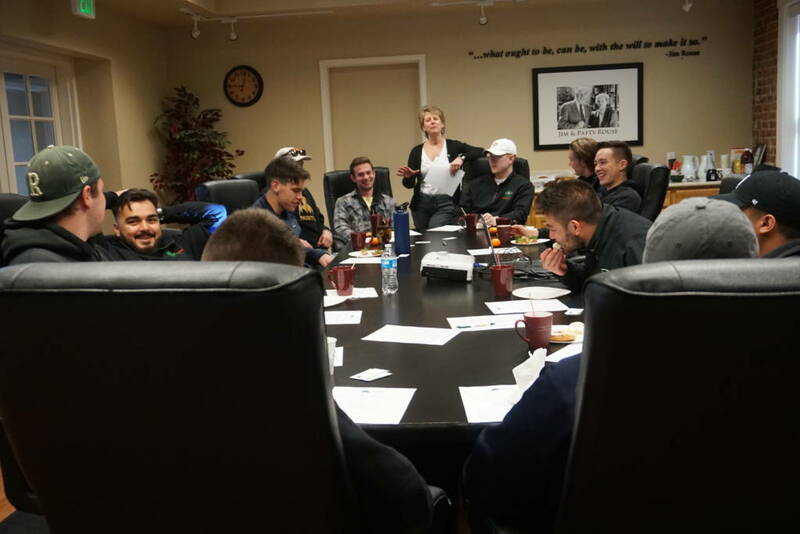 The meaning of immersion is to “dip into”, so in this context, immersion would be to dip into service, which I had the great opportunity to do so thanks to Phi Kappa Psi and its alumni that helped pay our way to Denver, Colorado. When I first heard about this trip, I thought to myself what an interesting name, because most trips like this are called alternate spring breaks, to do service, but what Phi Psi turned this into was way more than just something to fill my spring break and complete my service hours. 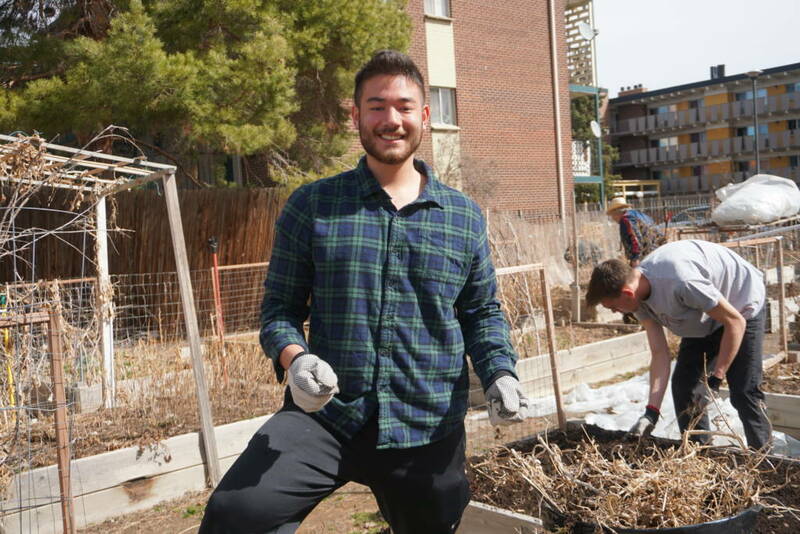 Phi Psi went above and beyond, and allowed us to truly “dip into” what the root of poverty was in the Denver area, as well as what programs there are in the local area to combat it. Food bank of the Rockies, Hope Communities, United Way, and Metro caring were all the organizations we volunteered at throughout the week. What was so nice about how Phi Psi set this trip up was that they tried to have it so we 1) learned about the different organizations before the trip, 2) took different aspects of organizations that try to fight poverty and help the needy. 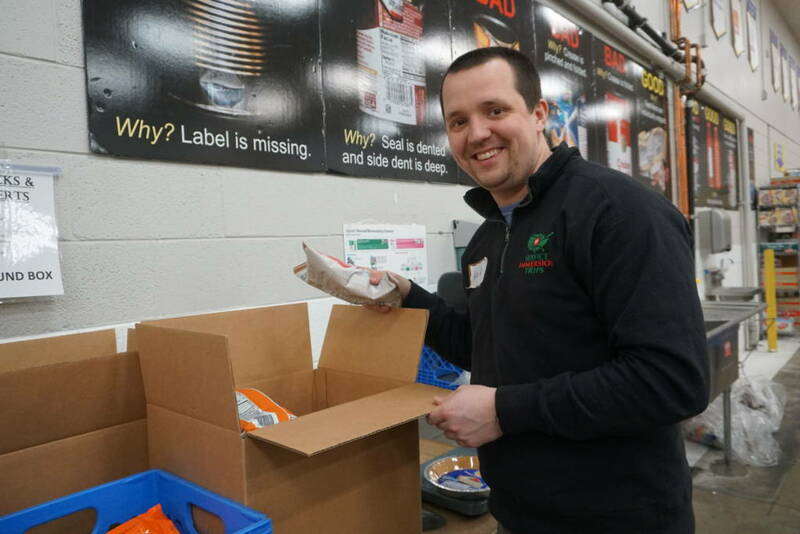 The food bank is what many of us have volunteered at before, where goods are donated and food is sorted and packaged, pretty simple and here in Akron, Ohio we have that as well. Hope communities was about giving a place to stay that was affordable, as well as giving programs to those who live in the communities. Metro caring was a very interesting twist on a food bank type, where they had a market type system, so those who needed food could come and take whatever they needed for the week, no cost and no judgement. Metro caring also had programs for how to cook, and eat healthy, etc. which goes along with the saying of to teach a man to fish, versus doing the fishing for them. 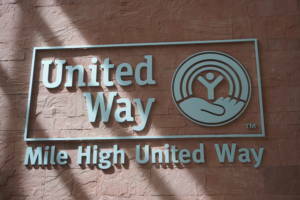 Finally, United Way was interesting as well, because they are pretty much the middle man, in which they know all the contacts for all the non-profits in the area, and how to contact them and how to get help for those in need. 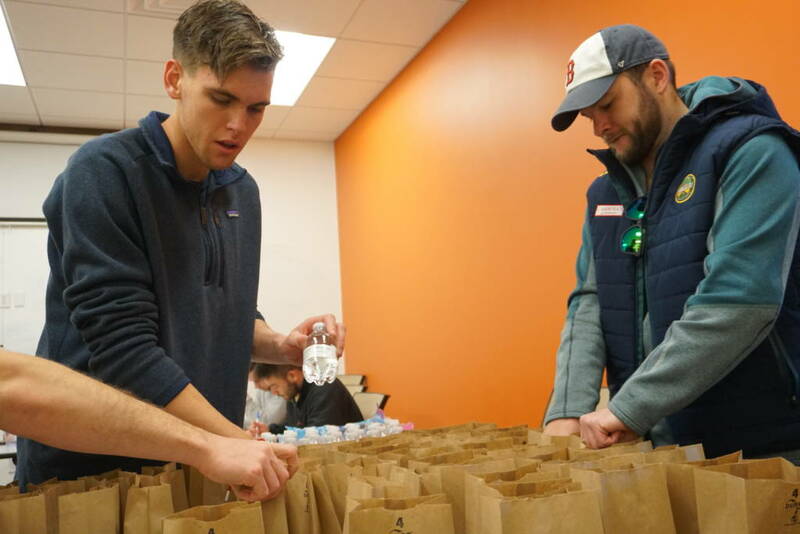 Phi Psi not only allowed me to learn more about service and poverty, and how to take ideas back to my own community, but also allowed me to connect with fellow brothers across the nation. Spending a week with these other men really made me aware that we all have the same values and beliefs, to do good in the world. All of us brothers on the trip connected instantly and I would go on a trip similar to this in a heartbeat with fellow Phi Psi’s.Thank you to the donors and alumni that made this trip possible. Without you I would have been stuck in Akron, Ohio procrastinating all my projects, but instead had the opportunity to make a positive impact in the world. Thank you again. I would like to start my reflection off with a thank you to all the Phi Kappa Psi alumni who’s gracious donations allowed all of us undergraduates to attend this service immersion trip. I know that without their help I personally wouldn’t have been able to attend the trip, as being a broke college paying for his school himself money is tighter than ever. Instead I was able to pay a total of $100 to not only travel out to Denver Colorado from Corvallis Oregon, but also see all of the amazing places and people which the Denver metro area has to offer. There were five of us from Oregon Beta that had the opportunity to attend the service immersion trip. So many of us applied from Oregon State University that some of our chapter members were put on a waitlist and told to try again next year. As funny as this was, I’m grateful to have been selected, as the trip taught me so much about myself and the fight against poverty. From the moment that we landed at the Denver Airport and met up with the other Phi Psi’s from around the country, we could all tell that it was about to be a super fun week. Right off the back we were bantering with each other and telling stories like the 13 of us were old friends, not new ones. These newly forged relationships were only strengthened each and every day as we spend every waking moment together. 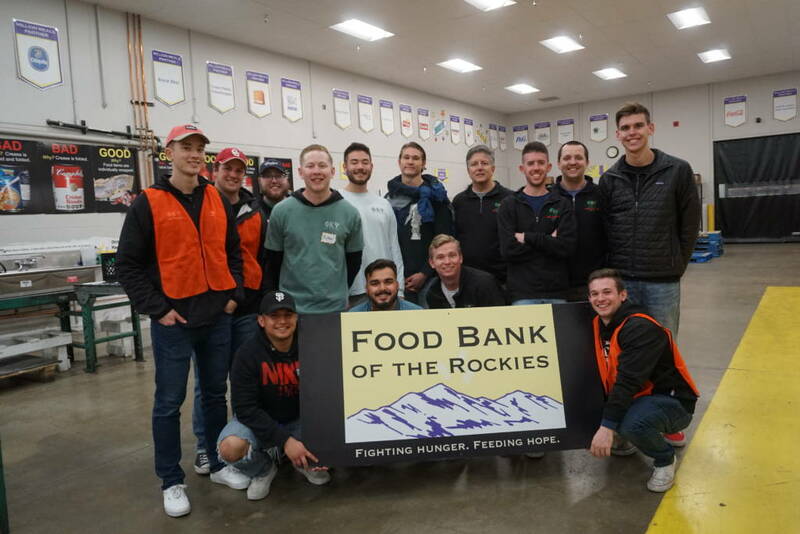 On Monday, our crew, self dubbed ‘The Phi Kappa Psi America Alpha Chapter’ went to the Food Bank of the Rockies, where we did a lot of behind the scenes work combating food insecurity. At the food bank we were broken into groups of three, where we went around the warehouse putting together orders that could consist of anything from cleaning supplies to baby food. This was followed by a trip to Red Rocks Amphitheater, where we learned more about each other, and what we could do to help those in need. Tuesday was spent at Hope Communities. They are a non profit housing operation, which offer cheap housing to those in need, especially refugees, and those in severe poverty. This was direct service, and felt really good to do. Personally, I spent a lot of time painting. Painting walls, ceilings, letters on garden beds, and even my face on accident. While painting is hard and time consuming, it felt really good to give bad in a first hand way, and to see the faces of the community members who saw the work we got done. Wednesday was a free day, where we spend our time exploring the Denver area. This included visiting the botanical gardens, the Denver aquarium, and a Colorado Avalanche hockey game. On Thursday we partnered with a non-profit called Metro Caring. 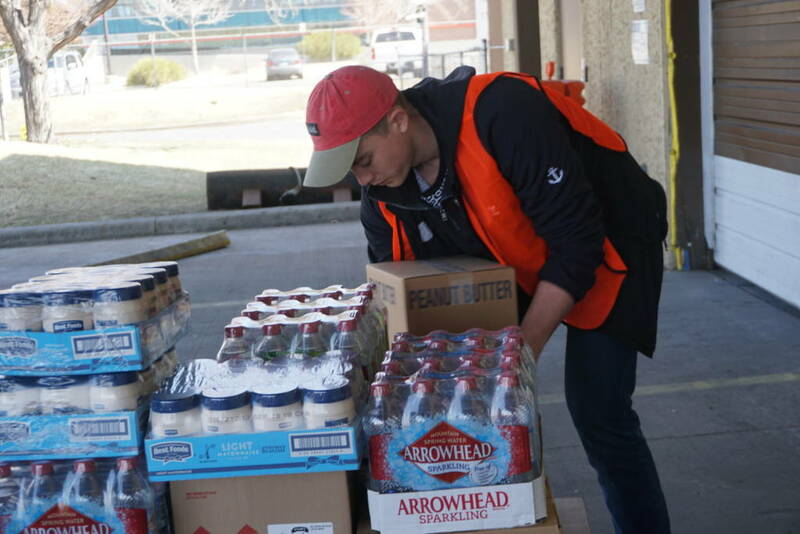 Metro Caring was essentially the front side counterpart of the Food Bank of the Rockies. Metro Caring acts like a local grocery store that operates with no judgement, as shoppers don’t have to pay a dime for the food they get. 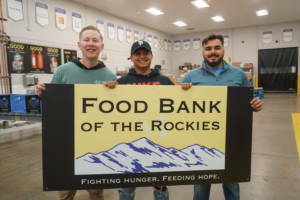 Friday was our return to the Food Bank of the Rockies, where we packaged food and prepared it for delivery to frontline stores such as Metro caring. This trip was the best thing I could have done to fill up the week I had for my spring break. I cannot express my thanks enough to Kyle Hickman and Lauren Krznarich whom put this trip on for us, and gave us the opportunities to learn about food insecurity, poverty, each other and ourselves. Knowing that this was the first of these service trips to have happened, I know that there are some kinks which can be worked out. However, I think that the trip went super well, and that trips like this are essential to the fraternity experience surviving into the future. Thanks again to the donors who made this happen! LEDN! I am so thankful for the opportunity to use my spring break productively and take one of the best trips of my life to serve the Denver community and learn about what it means to serve while simultaneously building lasting relationships with Phi Psis across the country. The donors that made this possible deserve the most praise because this was a life-changing experience for me and one I will remember for the rest of my life. One aspect of the trip that changed my perspective the most was the perspective that we viewed service from. During this trip, I was shown the organizational aspect of service and the attitudes of the people that worked for these organizations inspired me to think of service from the shoes of people that use their life for service. I thought of service as asking people “what do you need?” instead of “what do I want to do for you?” It taught me that the best way that I can use my youth and charisma in service is to do the things that the organizations and community members need because what I want to do for them might not be very constructive. On the trip, we compared this idea to “voluntourism”, or doing service that didn’t need to be done and doing it for the wrong reasons. To avoid this, we asked the organizations what they need done and our group of young men were used like tools to combat poverty. To build on the topic of the men in the group, I made some very lasting relationships with a bunch of enthusiastic Phi Psis across the country and we meshed immediately. Fresh off the plane, sitting in the airport waiting for our ride to arrive, it was clear we were all going to be very comfortable. I think this was very constructive to building relationships that were focused on the service we were doing. I could tell that not only did we all want to hang out together, but we all understood that we had a common goal, to squash poverty in the Denver area. For that week, we were a very driven group of brothers that instantly had a connection and that was likely the biggest contributing factor to our success that week. One of the things that I am going to bring back to my chapter and my community is the enthusiasm that we had for service. In my chapter, the members are always excited to do service, but the Service Immersion Trip took that excitement to another level. I hope to see my chapter have the amount of excitement and selflessness that I saw out of the brothers on the trip. I am truly grateful to the donors that allowed this service opportunity to happen and hope that many other Phi Psi brothers in the future get the chance to have the same experience I did.